This recipe appeared December 2009's Cooking Light. The only changes I made was to use plain tomatoes (the recipe called for pre-seasoned) and substitute dry parsley for fresh. 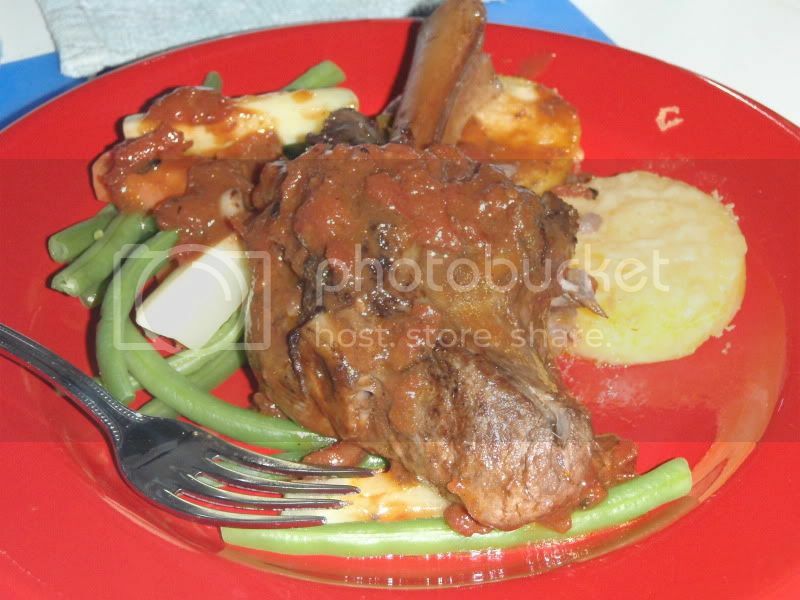 This was the easiest way I've ever cooked lamb and my first ever lamb shank. In a large dutch oven, salt and pepper lamb and brown in oil over medium high heat, about 4 minutes on each side. Remove from pot. Add the garlic to the pan, cook for 15 seconds (it will immediately sizzle and start to brown/burn). Add the wine; cook for 2 minutes while scrapping the bottom of the pot. Stir in tomatoes and cook for another few minutes. 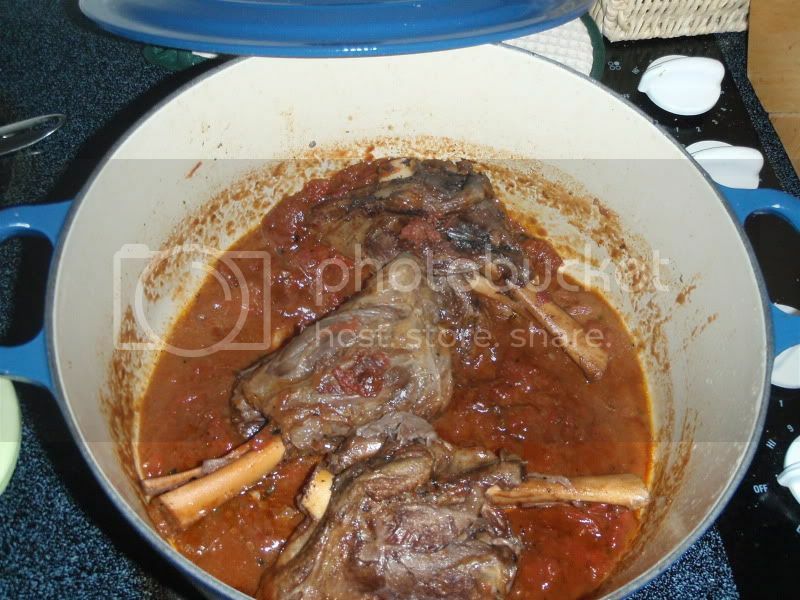 Return lamb to pot; cover and reduce heat; and simmer for 1 hour over low. Turn lamb over and cook for another 1-1.5 hours until meat is tender (My lamb shanks were huge, so it took nearly 3 hrs). 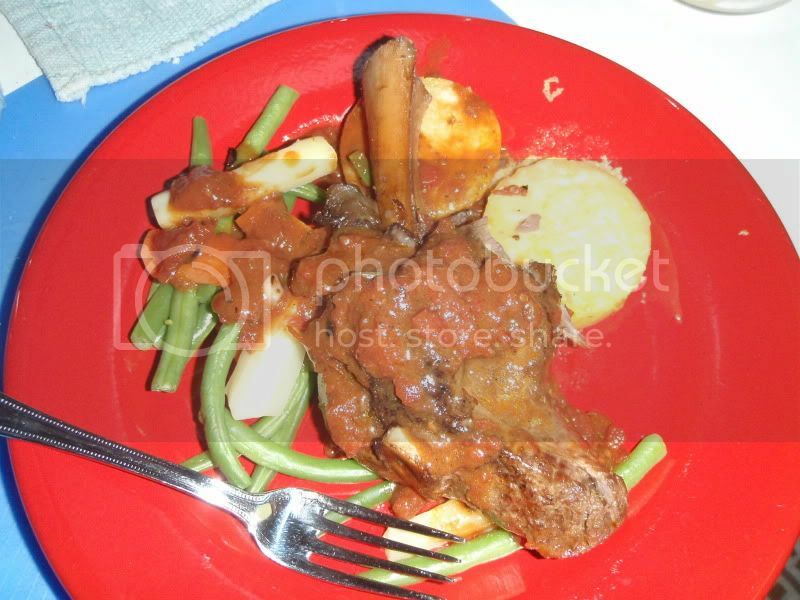 Remove lamb from pan and loosely cover with foil. Bring wine/tomato mixture to a boil and cook until reduced (about 10 minutes). Season with salt, pepper, and parsley. Return lamb to pot and cook another few minutes until lamb is heated.